ECM has requested a copy of the final staff report, along with any changes made from the draft, and will publish it once received. The tribes petitioned the NAHC to investigate and conduct a public hearing to consider tribal requests to declare the entire 12,500 acre site a ‘sanctified cemetery’. Tribes also sought to have the project halted to assess damage and want agencies to consult with tribes to agree on mitigation measures to prevent further harm to a broader region. The case has broad national significance, with hundreds of millions of acres of public lands slated for renewable energy projects. 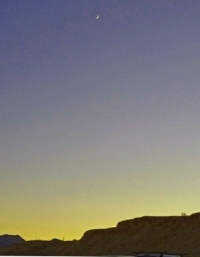 Before the project was built, tribes argued that the project would cause irreparable harm in an area that includes a cultural and “spiritual landscape” of religious significance.The cultural landscape includes 22 sacred sites recorded with the California Historical Resources Information System at San Diego State University. Approximately 2 million acres of California desert lands are under development for renewable energy through 200 separate projects, according to the U.S. Environmental Protection Agency, which has proposed putting projects on already polluted lands such as brown fields instead. But tribes argue that the BLM was swayed by developers’ money, “driven by apparent economic interests” while failing in the agency’s duty to protect cultural resources. Numerous tribes gather annually in the area. 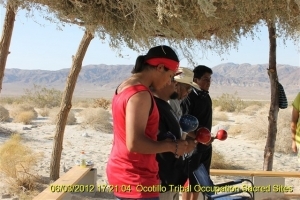 Tribal elders have testified about their parents and grandparents taking them to Ocotillo for ceremonies. Imperial Valley Desert Museum in Ocotillo hosts an annual Indian Fair drawing Native Americans from many tribes. Ceremonies have continued through the onset of the project, including a wake held to mourn the desecration of tribal members' ancestors by Pattern Energy's project. The landscape includes many sacred sites, such as Signal Mountain, a place of reverence. 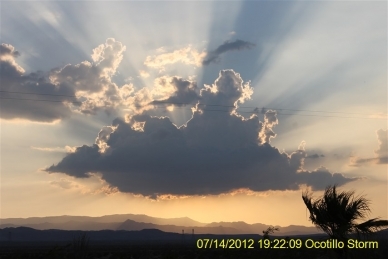 Local tribes refer to the Ocotillo Valley as the Valley of Death due to many burial sites there. State archaeologists have previously identified 523 sets of Native American remains in the vicinity. The NAHC informed Imperial County back in 2010 that there were sacred sites in the area of potential effect and sent a follow up letter in August 2011, yet the county “never contacted the NAHC to inquire about the sacred sites that were identified in the project area,” the report revealed. These are sites in the NAHC Sacred Lands Inventory, not sites recently submitted merely to stop the project, the NAHC report pointed out. Nor did the California Public Utilities Commission, nor the Bureau of Land Management. In October 2011, the chairman of the Southern California Tribal Chairmen’s Association representing 19 tribes also sent a letter to the BLM’s California director criticizing the process and inaccuracies in the environmental documents. The report added that “no meaningful consultation” occurred to resolve tribal concerns as agencies faced a fast-track process with a deadline to have the wind facility operational before January 1, 2013 in order to get federal tax subsidies for the developer. Viejas declared the project a Traditional Cultural Property eligible to the National Register of Historic Places. 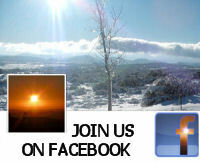 Quechan concurred that the project was eligible for both state and federal protections. The California State Historic Preservation Officer notified Imperial County in March and April 2012 with a reminder that public agencies must protect such resources. 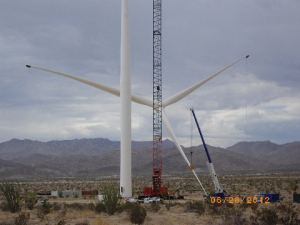 The report noted that even tribes that have supported wind projects elsewhere may not support Ocotillo’s wind project; for example the Manzanita Band of the Kumeyaay Nation’s tribal consultant coordinated the forensic dog team searches that found numerous additional ancient Native American human remains on the site in May and July 2012. The BLM and Pattern also denied tribes’ request to use forensic dogs trained to find ancient remains, even though the State of California has utilized the canines and deemed them reliable. Pattern refused to fund the survey and the BLM refused to require it. So local tribes funded a partial dog search themselves of just 16 to 18 turbine pad sites on 5% of the site. Dogs found dozens of probably ancient remains. Tribes were unable to search 95% of the site and construction continued regardless of the many finds, bypassing only the areas where remains had been found, without regard for tribal concerns that remains were likely present at other turbine sites. Despite this, foundations were excavated, filled with concrete, turbines built, roads graded, and a substation built. Although ultimately confirmation was made by the Imperial Valley Coroner of numerous ancient remains “the remains were not re-buried; they are still on the surface of the ground,” the report stated, evidencing this further desecration of tribal members’ ancestors. Tribal leaders did, however, offer emotional testify to the County of Imperial Supervisors pleading to protect their ancestors’ burial sites and sacred lands, but their concerns were ignored. A lawsuit filed by Quechan so ught a temporary restraining order, which was denied; their suit continues to languish in the court system. Letters from tribal leaders of Viejas and Quechan to President Barack Obama voicing concern about “rough-shod trampling of Native American governmental rights and cultural concerns” from fast-track projects such as Ocotillo Wind Express were never addressed. 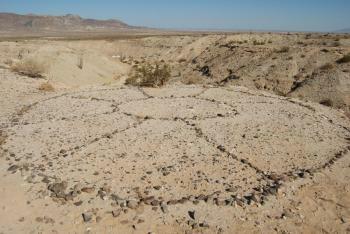 The commission found that the spoke-wheel geoglyph in Ocotillo, listed on the National Register of Historic Places, is clearly a ceremonial site and that the standard of “multiple remains” identified by the coroner meets the state standard for protection. With hundreds of millions of acres of public lands targeted for renewable energy projects, the ramifications are vast. Why is it that in Australia and Germany a Building Permit is not required for residential roof top PV solar installs? Why is it that Electrical Remodeling Permits, in the San Diego region are issued Over the Counter with no plans or lengthy and onerous submittal required, yet PV installs often less complex, require expensive and time consuming submittals? Why is it that something as structurally dangerous as a second story deck be issued an Over the Counter Building Permit with nothing more than a very simple sketch and a *City provided* standard detail, no engineering required--yet a PV install that has fewer structural considerations than a deck often require structural engineering? Contact your local City Council, demand the Australian model for authorizing residential PV installs.